Edited by Omi Osun Joni L. Jones, Lisa L. Moore, and Sharon Bridgforth. University of Texas Press (July 1, 2010) Click here for purchasing information. In Austin, Texas, in 2002, a group of artists, activists, and academics led by performance studies scholar Omi Osun Joni L. Jones formed the Austin Project (tAP), which meets annually in order to provide a space for women of color and their allies to build relationships based on trust, creativity, and commitment to social justice by working together to write and perform work in the jazz aesthetic. Inspired by this experience, this book is both an anthology of new writing and a sourcebook for those who would like to use creative writing and performance to energize their artistic, scholarly, and activist practices. 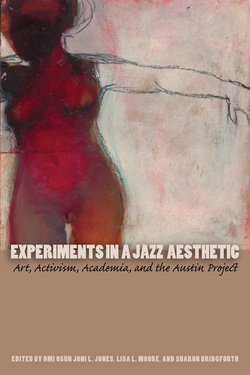 Theoretical and historical essays by Omi Osun Joni L. Jones describe and define the African American tradition of art-making known as the jazz aesthetic, and explain how her own work in this tradition inspired her to start tAP. Key artists in the tradition, from Bessie Award–winning choreographer Laurie Carlos and writer/performer Robbie McCauley to playwrights Daniel Alexander Jones and Carl Hancock Rux, worked with the women of tAP as mentors and teachers. This book brings together never-before-published, must-read materials by these nationally known artists and the transformative writing of tAP participants. A handbook for workshop leaders by Lambda Literary Award–winning writer Sharon Bridgforth, tAP's inaugural anchor artist, offers readers the tools for starting similar projects in their own communities. A full-length script of the 2005 tAP performance is an original documentation of the collaborative, breath-based, body work of the jazz aesthetic in theatre, and provides both a script for use by theatre artists and an invaluable documentation of a major transformative movement in contemporary performance. Omi Osun Joni L. Jones describes and defines the African American tradition of art-making known as the jazz aesthetic, and explain how her own work in this tradition inspired her to start tAP. Laurie Carlos, Daniel Alexander Jones, Robbie MaCauley, Zell Miller 111, Carl Hancock Rux, Maiana Minahal, Jeffrey “Da’Shade” Johnson, Daniel Davis Clayton, Martha Perez and Danse Adje, Darla Johnson, a special conversation with raúlrsalinas, cover artwork by Tonya Engel, and more. Shannon Baley, Rajasvini Bhansali, Detine Bowers, Sharon Bridgforth, Florinda Bryant, Theresa Burke, Monique Cortez, Geeta V Cowlagi, D’Lo, Dulani, Amber Feldman, Bianca Flores, Kristen Gerhard, Erika Gonzalez, Gloria Gonzalez, Virginia Grise, Alyssa Harad, Amanda Johnston, Omi Osun Joni L. Jones, Angela Kariotis, Ana-Maurine Lara, Jacqueline E. Lawton, Krissy Mahan, Rosalee Martin, Carole Metellus, Lisa L. Moore, Courtney Morris, Jane Park, Deisi Perez, Jaclyn Pryor, Shia Shabazz, Julia Smith, Tracey Swan.